One of the most important things in life is having a roof over your head and four walls around you to keep you safe from the weather and protect you from burglars. Having a home of your own makes you feel safe and secure however; it is very important that you maintain the property to ensure that it will do its job for a very long time. Of course, part of that maintenance is having your roof inspected every few years and naturally, after any severe storms. While it would be lovely for roofs to last forever, they don’t. Most can be expected to last about twenty years, providing no unexpected damage has occurred. Unfortunately, even the most fastidious homeowner or commercial property owner can be thrown a curveball when a tropical storm or hurricane whips through the area. These storms are known to cause severe damage to roofs, ripping shingles off and strewing them about the neighborhood. When a roof has been damaged, it is essential that the property owner takes action to mitigate any further damages. This is usually done by tarping the roof. 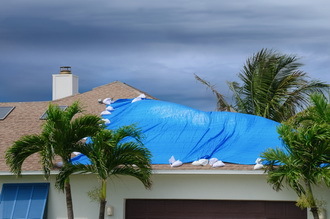 Our public adjuster expert works with tarp installation professionals to assist you even before your claim is settled. Unless a roof is neglected, any time a roof leaks it is completely unexpected. More often than not, there is some sort of outside cause of it. This cause could be a storm, a tree falling on it, or even debris buildup in the gutters. Insurance companies do their best not to pay or pay smaller than appropriate amounts on roof leak claims. It’s the job of the inhouse adjuster to pay as little as possible, and they are good at their jobs. You very well might need to enlist the help of a professional public adjuster. The Best Public Adjuster of Stellar Public Adjusting Services will guide you, handle, and deal with all aspects of your insurance claims to get you the best possible settlement. When a home or commercial property sustains damage to the roof, many more problems can reveal themselves later. 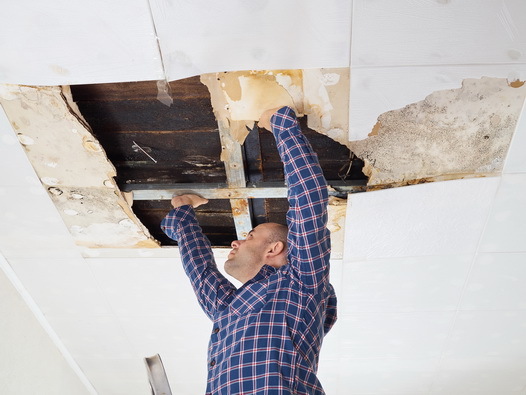 With a leaking roof, there is bound to be damage to the trusses, attic, insulation, and drywall ceiling, and potentially wood floors or carpeting. Most insurance companies depreciate everything, and only pay the depreciated value. Some claimants have accepted depreciation on things that do not depreciate, such as roof trusses, insulation, and drywall. Nobody sits in the living room and decides it’s time to replace the drywall. Drywall that has not been damaged will last forever. Let The Best Public Adjuster go to bat for you against your unreasonable insurance company. The Best Public Adjuster of Stellar Public Adjusting Services offers professional assistance as a licensed public adjuster to assist homeowners with their insurance claims. The insurance company’s inhouse adjusters can be bullies, and they will do everything they can to prevent you from getting the payout you deserve. Call 305-684-6845 to speak to our public adjuster expert.